St. Patrick's Day holds a special significance to me. I was born and raised in New York, so I am and will always be American. But both my parents were from Ireland, which was a pervasive cultural influence in my household growing up. Now that both my parents have passed, I realize that I can no longer take that for granted. It is my responsibility - and privilege - to remember that heritage. But it is an Irish-American heritage, and St. Patrick's Day in the US is an Irish-American holiday. A time to celebrate the culture and influences the Irish have brought to this country, and my family. I am happy to celebrate that, along with the Portuguese-Italian influences my wife's family brings, and all of the other international and regional influences we have come to know and love as an integral part of this country. So what are the required components of a St. Patrick's Day celebration? Consumption of alcohol. Men parading up Fifth Avenue in skirts. Women with green hair. Could be any weekend. Green bagels? Bagpipe music? Getting closer. Irish soda bread, corned beef and cabbage - now we're cooking (pun intended). Let's talk about some classic dishes associated with the holiday. 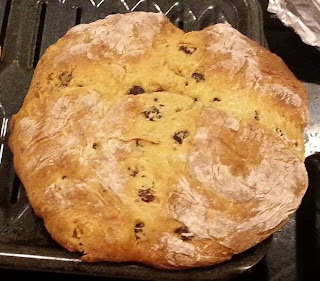 Soda bread is a "quick bread" rather than a yeast bread, meaning that it gets its airiness from the chemical reaction between a base (baking soda) and an acid (buttermilk), producing lots of tiny carbon dioxide bubbles which leaves tiny gaps in the baked bread. Yeast breads depend on cultivating lots of little yeasties in the dough that convert starch into sugar, and then consume the sugar, expelling carbon dioxide. Same effect, trickier to accomplish. - Those who prefer a less rich soda bread can cut back on the butter, sugar, and raisins. - For a heartier (and healthier) texture, substitute whole wheat for up to half of the flour. Well, it seems that a working class family from generations past in Ireland would have baked a loaf from four simple ingredients: flour, buttermlk (the liquid leftover from churning butter), baking soda, and salt. Butter, sugar, eggs? Those were cake ingredients, not bread. This was an everyday bread that could be at any meal - with butter or jam for breakfast, a slice of meat for lunch, or sopping up your stew at dinner. The modern equivalent would be Irish Brown Bread, which I believe is quite common in Ireland as well as Irish restaurants. The flour traditionally used was coarser, not as refined or processed, and lower in gluten that today's typical all-purpose flour. You can try to get your hands on flour or bread mix from Odlum's, a traditional manufacturer. Modern recipes attempt to duplicate the course texture by using mostly whole wheat flour and adding some rolled oats or wheat germ. Sugar and butter are minimal, and either buttermilk or plain yogurt can be used. Here is a link to a recipe that produces a darn good hearty (and healthy) loaf. Corned beef is a salt-cured beef brisket, the name originating from the kernel shaped granules of salt used in the process. A traditional meal? It's complicated... I did some research, and it's a heck of a story. It seems the Irish were one of the cultures that developed the process, and Ireland was one of the prime producers of corned beef for a couple of centuries. But not for internal consumption. See, the British overlords used Colonial Ireland as their private cow pastures. The best beef was sent to England, and the lesser cuts "corned" and used as naval provisions or for international trade. As that trade became increasingly lucrative, the English co-opted more and more Irish countryside into grazing land. Losing valuable farmland, the Irish were forced to rely more heavily on potatoes, which could grow under poor conditions. And that's why the Potato Famine of the 1840's was so devastating. All the while beef remained prohibitively expensive in Ireland. But the Irish immigrants in New York and Boston found reasonably priced corned beef available from their friendly neighborhood Jewish butchers. The Irish considered this a luxury item, appropriate for celebrations, and it went well with the cabbage and root vegetables they favored. Thus grew the tradition. Remove the brisket from the package and rinse well to get rid of excessive brine. The meat will be salty but otherwise a little bland, so you need to kick in some spice. Many briskets come with a spice packet, which will do fine. Or you can use a tablespoon or two of pickling spice, if available. Otherwise, use a bay leaf, a teaspoon of white or black peppercorns, some cloves, and a berry or two of allspice. My favorite method comes from my wife, who knows how to cook... as opposed to me, who knows how to eat. It is easy to scale up for a crowd, as you can get 2 to 3 briskets is a large pan, or use multiple pans. Add some onion slices to the bottom of a baking pan. Place the brisket in the pan, fatty side up. Lay some more onion slices on top. Sprinkle with the spices. Add about 1 1/2 inches water to the pan. Cover the top with foil and crimp the edges to seal. Bake for 3 to 4 hours. Test done-ness by inserting a fork into a thick part of the meat. It should give easily, like you could just pull it apart. Otherwise seal it back up and give it more time. When done, remove from the oven and let cool before slicing. Important: Carve thin slices across (perpendicular to) the grain, not with it, to avoid the meat being stringy or chewy. Over the top: For an extra special treat, a friend recommends putting a coating of mustard and brown sugar on top of the cooked brisket and putting it back in the oven uncovered until it caramelizes and forms a spicy-sweet crust. You can cook the entire corned beef and cabbage meal in one pot. Place the brisket in a large pot, covered with water. Add the spices, and maybe a quartered onion. Boil for 2 to 3 hours. Remove some water skimming out some of the froth that may have formed on the top. Add a quartered cabbage, a couple of quartered potatoes, several carrots, cut into chunks. Add enough water to cover and continue boiling for another 45 minutes to an hour, until the vegetables are tender. If you cook the cabbage and other vegetables separately from the meat, make sure to start with generously salted water. You can add the same spices. Boil for 45 - 60 minutes, until desired tenderness.